Barachiel (Heb. ברכיאל "Bārkiʼēl", blessed by God; Arabic: بُراقيل "Burāqīl") is one of the seven Archangels in Byzantine Catholic and Eastern Orthodox tradition. 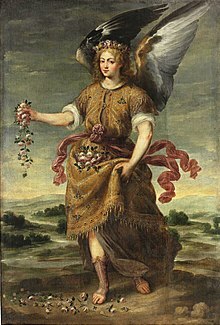 Archangel Barachiel Scattering Flowers by Bartolomé Román, 17th century. In the Third Book of Enoch he is described as one of the angelic princes, with a myriad of some 496,000 ministering angels attending him. He is described in the Almadel of Solomon as one of the chief angels of the first and fourth chora. 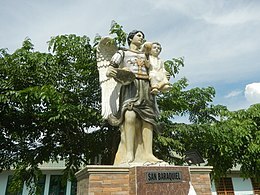 He is often confused with the angel Baraqiel who is regarded as the angel of lightning. In iconography Barachiel is sometimes shown holding a white rose against the chest, or with rose petals scattered on the clothing particularly the cloak. The scattering of rose petals was to symbolize or represent God's sweet blessings showering down on people. In Roman Catholicism, Barachiel is depicted holding a bread basket or a staff, both of which symbolize the blessings of children that God bestows on parents. Barachiel is also traditionally associated with the month of February and the Zodiacal sign Pisces. He is also sometimes described as being the ruler of the planet Jupiter and the zodiacal sign Scorpio. The Third Book of Enoch describes archangel Barachiel as one of the angels who serve as great and honored angelic princes in heaven, and mentions that Barachiel leads 496,000 other angels. He is considered one of the seraphim class of angels who guard God's throne, as well as the leader of all the guardian angels. O Powerful Archangel, St. Barachiel, filled with heaven’s glory and splendor, thou art rightly called God’s benediction. We are God’s children placed under thy protection and care. We are in the world filled with confusion and demonic influences. Come to our aid as we do not know our left and right; how to relate to Jesus on daily bases; how to be sensitive to the Holy Spirit - Spirit of truth. Let the joy of the Lord be our strength. Hear our supplications (name them). Grant that, through thy loving intercession, we may reach our heavenly home one day. Sustain us and protect us from all harm that we may possess for all eternity the peace and happiness that Jesus has prepared for us in Heaven. Present to God the Father all of these petitions, through Jesus Christ, our Lord, together with the Holy Spirit, forever and ever. Amen. "The heavenly host and our modern life". Transfiguration of Our Lord Russian Orthodox Church. Archived from the original on 14 December 2005. Retrieved December 22, 2005. "The rational heavenly powers". Transfiguration of Our Lord Russian Orthodox Church. Retrieved December 22, 2005. "Angel Names". Archived from the original on 2006-12-06. ^ Roeder, Helen (1956). Saints and Their Attributes. Chicago: H. Regnery Co. LCCN 56013630. ^ Sisung, Kelle S., editor. Angels A to Z. New York: Gale Research, Inc. 1996. ISBN 0-7876-0489-5.